It’s been about six and a half months since I brought Westley home. Despite a few rough patches in the beginning, we have made excellent progress, and are settled into something that decently approximates a schedule. He had a lot of trouble getting used to my dad, but they exist in affable companionship now. He has definitely decided that he likes the whole family, except maybe Brad. Brad is so short compared to the rest of us; I think Westley hasn’t figured out what species he is yet. Lately, when my mother and I are in the same room with him, and one of us gets up to go to another room, he experiences visible distress as he tries to figure out who he should stay with. Westley’s a bit neurotic and definitely has more than a touch of OCD. His foster mom described him as routine-driven, which is a massive understatement when he’s a solo dog, as it turns out. He’s kind of emotionally needy. (That’s a massive understatement, too.) He is affectionate and demands affection from us, but can decide suddenly that he needs space. He is even more food driven than he was when I got him – he goes and stands in his crate about 30 times a day in hopes of getting a treat. He is silly sometimes, and these days plays at least once a day. (It took him weeks to figure out the whole playing thing.) He is shockingly obedient 90% of the time with commands he knows – “down,” “leave it,” and “sit” he totally owns. “Off” is the one he sometimes has trouble with. He seems to think “stay” is an interjection of indeterminate meaning. I am most amused these days by Westley’s butter obsession. If you go to the fridge and pull out a box of strawberries, he’ll still be in the den lying on his bed. But the second he hears the butter tray cover move, he is THERE. He has, so far as we know, eaten about a stick and a half of butter since we got him – he once got a whole stick of it off the counter. He’s not nearly as bad a “counter-surfer” as he used to be, but he manages to swipe something or put those big front paws of his on the counter and inspect the “offerings” once a week or so. Because he is so routine-oriented, it has taken awhile for him to learn some basic things like “Mommy always comes home eventually,” “Mommy always comes home eventually,” and “Mommy always comes home eventually.” Here are some other things he’s figured out. Uncle KJ goes and comes and comes and goes. He is my very favorite person who isn’t Mommy. Or Nana, sometimes. Or whoever has a treat. Nana is great to hang out with when Mommy is gone (and sometimes even when Mommy is not gone). Aunt Katie takes me on walks ALL THE TIME when I’m at her house. But she doesn’t like me running around when the baby is up. Uncle David lives at Aunt Katie’s house. He is fun when we are outside. He is boring inside. I rather dislike being wet, but if I’m going to get a little muddy, I might as well get REALLY muddy all over. Getting a bath won’t cause me any permanent physical damage. Apple flavored treats are the best! OMG! 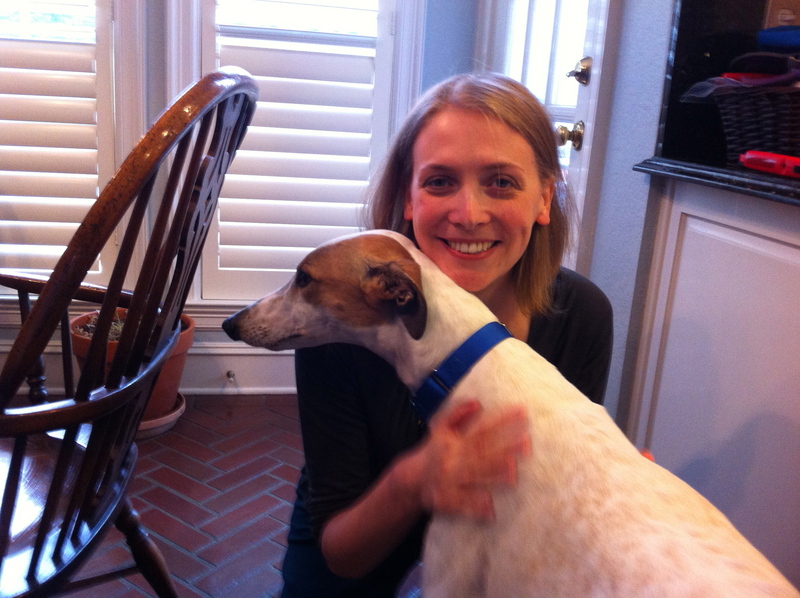 Ladies and gentlemen, I am proud and excited to announce that I finally have a pooch in residence! Westley came home today at 2:30, we showed him all around, and I signed the paperwork, and he’s all mine!!! He is so sweet. I love this dog. It turns out Westley (fka “Ugo Faust”) was quite the runner. He won 9 races, including the one before the race in which he broke his leg. He was very fast, but when a racing greyhound gets injured, there are two currently practiced options: giving him up for adoption or putting him down. 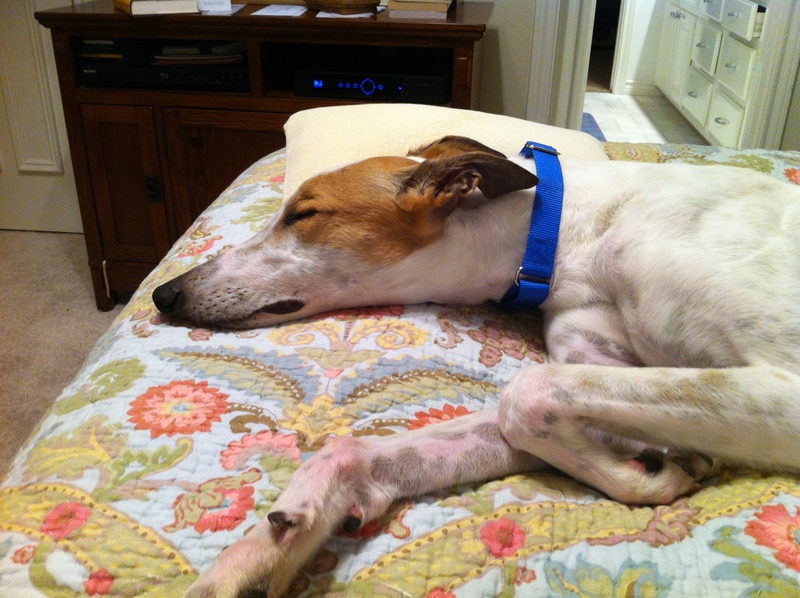 Thankfully, he was given to an organization called GALT (Greyhound Adoption League of Texas) instead of him getting a shot. GALT is a greyhound rescue and adoption group, but they are unique for three reasons: they take all greyhounds and greyhound mixes, they do whatever they must to get the dog in the best physical shape possible, and they put their dogs in foster care before they adopt them out. This means their dogs are highly adoptable: they have started figuring out what house living is like, their injuries are dealt with using the best veterinary care available, and they are living a retired lifestyle. 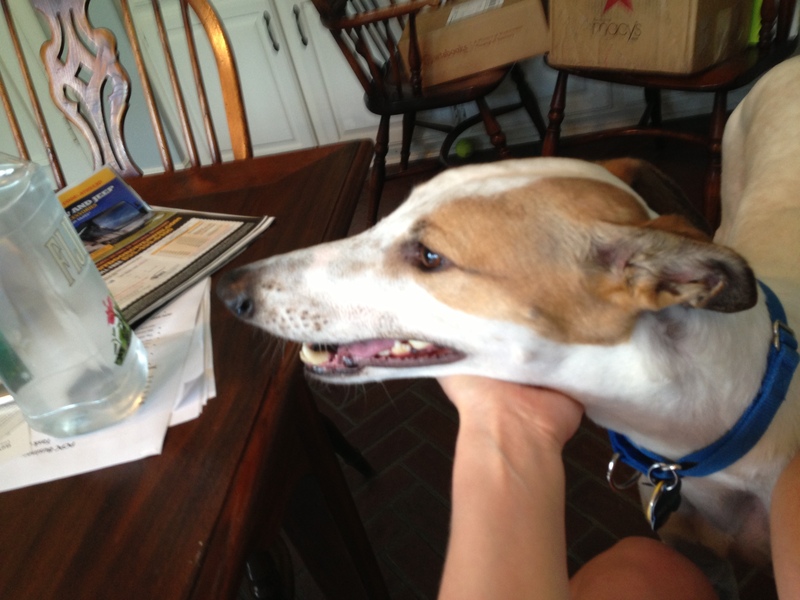 Greyhounds are very mellowed and laid-back, especially this one. They sleep a lot, but only require a 10-20 minute walk per day. They are snuggly, and love to be near their human friends. They are amiable and patient. Former racers have been taught very good leash manners, so they rarely pull on the leash on a walk. Their noses drip when they are anxious, and Westley seems to be relaxing, so his nose is going back to normal dog wetness. I am so happy, and he is quickly getting the hang of things. That fancy surgery out in California is finally on the planner in ink: January 31st! I am so excited!!! We’ll have a little bit of time to do sightseeing before the surgery, between pre-op appointments, so that will be fun. I’ve never been to California, but several regions in Cali are very high on my must-visit list. I doubt we’ll really get to see San Francisco (which is my #1), but we’ll get to explore farther south – San Jose and Silicon Valley mostly. I’m super-excited about the Winchester Mystery House – if I am only up for seeing one thing, I want it to be that. The surgery will take place near Palo Alto (read: Stanford), but the doctor’s actual office is in Los Gatos. So we’ll be kinda all over the place. 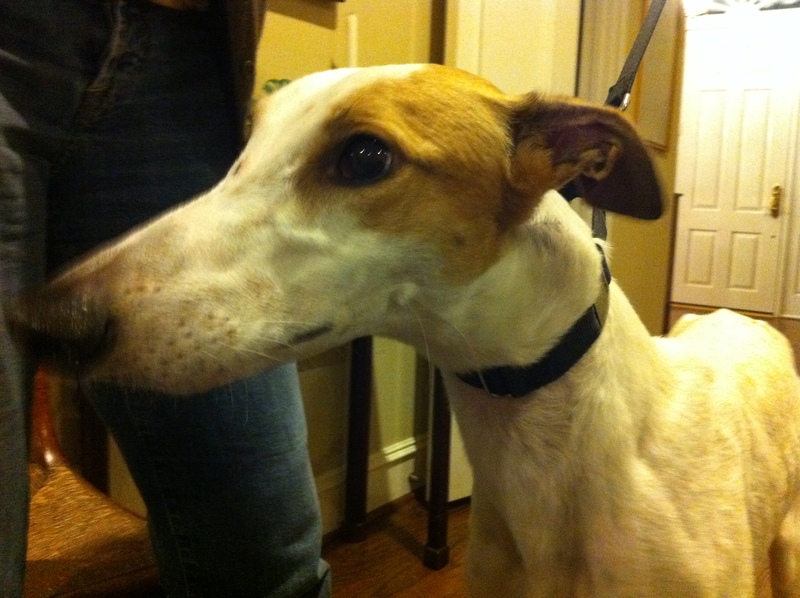 When I get back from surgery in California, I am getting a greyhound! His name is currently Faust, but we are so not sticking with a name with such notorious connections. (Not a fan of selling-souls-to-the-devil.) So I am changing his name to Westley. He is incredibly mellow, and when he met my nephew Brad, was soooooo patient with him. (Obviously, Brad does not know what “Don’t pull his ears” means – not that I’m planning to let that happen again.) He loves to just be near his “person,” so he’ll be a great companion for surgery recovery – and full recovery from this whole mess. Plus, I just like a dog who wants to hang out with you, who wants to snuggle or even just sit near you. He is smart and very food-driven, so it will be quite easy to train him, although he already knows a thing or two about a thing or two. 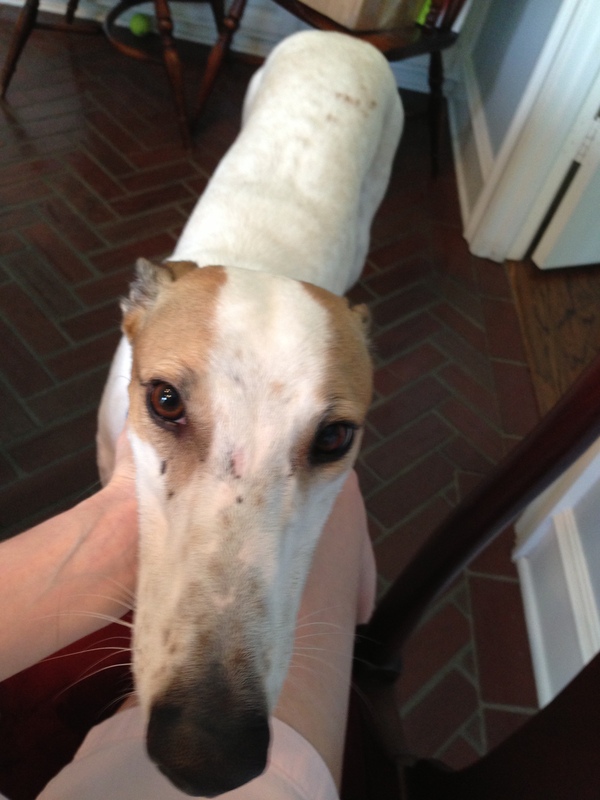 Greyhounds loved to be massaged everywhere, but particularly on their necks and butts. Additionally, they like their noses rubbed — top and bottom. After they’ve eaten, they will often try to clean off their noses by rubbing them on your furniture, blankets or you. The more you pet them, the quicker they will bond to you.